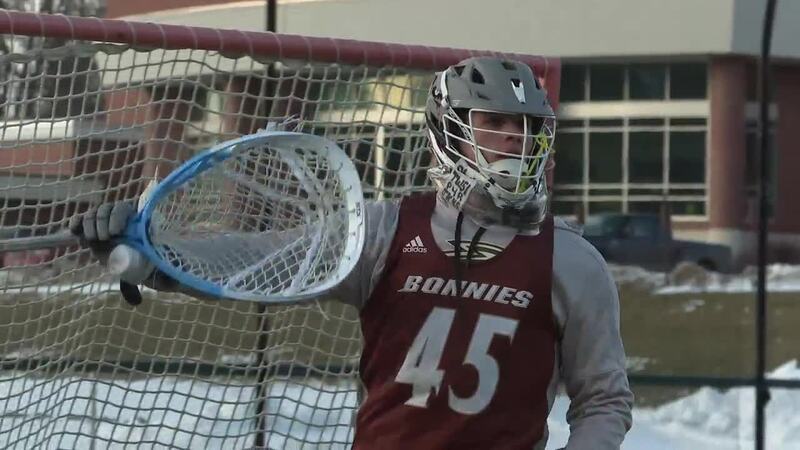 ST. BONAVENTURE, N.Y. (WKBW) — Brett Dobson and Sean Westley have been teammates and friends for a long time. "We've grown up playing lacrosse together and we've watched a lot of lacrosse together," Dobson said. The duo grew up in Ontario, each of them sharing a dream to play college lacrosse. That dream came true when Saint Bonaventure head coach Randy Mearns offered them the chance to play in the United States. "Going through it with [Dobson] him has made it a lot easier knowing you have someone who's been with you your whole life," Westley said. "So all of the stuff you have to deal with, you're doing it pretty much together." That includes being there for one another. "He [Westley] kind of knows because he's been there with me through a lot of it so he understands," Dobson said. In the third grade, Dobson was diagnosed with Type 1 diabetes. It's a condition where the body doesn't produce enough insulin. For a student-athlete, that's not ideal, but Dobson has powered through. "I think sports are his favorite thing in the world," Westley said. "It's what he's best at. I don't think anything can really hold him back from that regardless of what's going on and whatever he has to take care of. He'll do whatever it takes just to play the game he loves." When you watch Dobson at practice, he's non-stop, but he also knows to take care of himself. "I try to drink a lot of water, that also helps with lifting and being hydrated for games and practices," he said. "We also got a big bag of candy and Gatorade nearby incase my diabetes goes low." He aslo has an app that scans data from a sensor on his arm. "You scan your elbow and it'll give you your blood sugar and if it's going up or down," Dobson said. With his sensor hidden from the naked eye, Dobson is just another player among a huge support system that includes one of his best friends. "We've been through a lot together and I think it's pretty special and important that we get to be together and take on this journey," he said. "It's just a new chapter for us as teammates and friends."